The Tor Project, responsible for software that enables anonymous Internet use and communication, is launching a new mobile app to detect internet censorship and surveillance around the world. 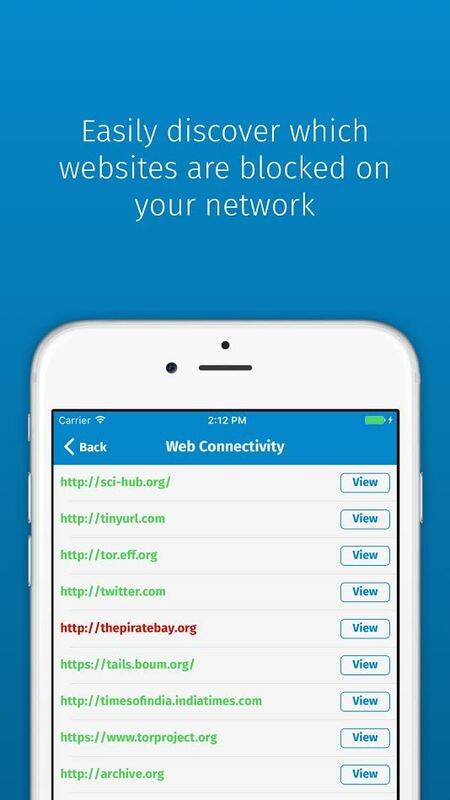 The app, called “OONIProbe,” alerts users to the blocking of websites, censorship and surveillance systems and the speed of networks. Slowing internet speeds down to a crawl is one way governments censor internet content they deem illegal. The app also spells out how users might be able to circumvent the blockage. Operating under the Tor Project umbrella, the Open Observatory of Network Interference (OONI) is a global observation network watching online censorship since 2012. Data from OONI has detected censorship in countries including Iran​,​ ​Saudi Arabia​, Turkey​, South Korea,​ ​Greece​,​ ​China​,​ ​Russia​,​ ​India​,​ ​Indonesia​ ​and ​Sudan​. The project watches over 100 countries and serves as a resource to journalists, lawyers, activists, researchers and people on the ground in countries where censorship is prevalent. In 2016, internet censorship was used in countries like the African nation of Gabon during highly contested elections and subsequent protests. To stop citizens from sharing videos of election irregularities, the country’s internet was down for four days. Earlier in 2016, Uganda engaged in similar widespread censorship. Both countries at times denied their actions, making tools like OONI ever more valuable. Internet freedom declined for the sixth year in a row in 2016, according to a report from Freedom House, making censorship and surveillance transparency a high priority for activists looking to turn back that momentum. Twenty-four governments blocked access to social media sites and communication services in 2016, compared with 15 governments doing so last year, according to Freedom House. Internet freedom fell most precipitously in Uganda, Bangladesh, Cambodia, Ecuador and Libya. Several countries, including Egypt and the United Arab Emirates, reportedly tried to block Signal, the increasingly popular encrypted messenger developed in the United States. That’s part of a global trend that’s seen governments go after apps like WhatsApp and Telegram in an effort to stymie secure communications. The app will be available on the Google Play​ and iOS app stores​ this week, according to Tor Project spokeswoman Kate Krauss.